Making as a means of exploring. Taking digital technology into the wild. To be inspired, to build, to be there. 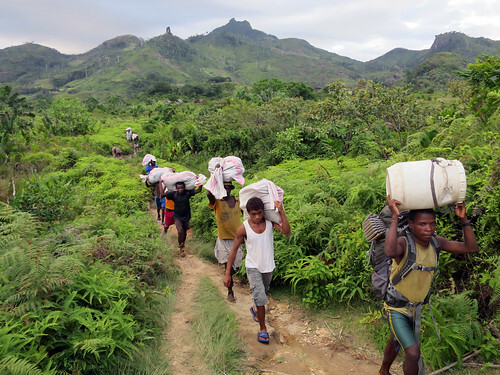 We set off on this expedition equipped with electronics and tools from the lab, prepared to build digital technology in the jungle of southern Madagascar. Two weeks later we emerged with a series of projects, a hard-drive full of documentation and lasting inspiration. 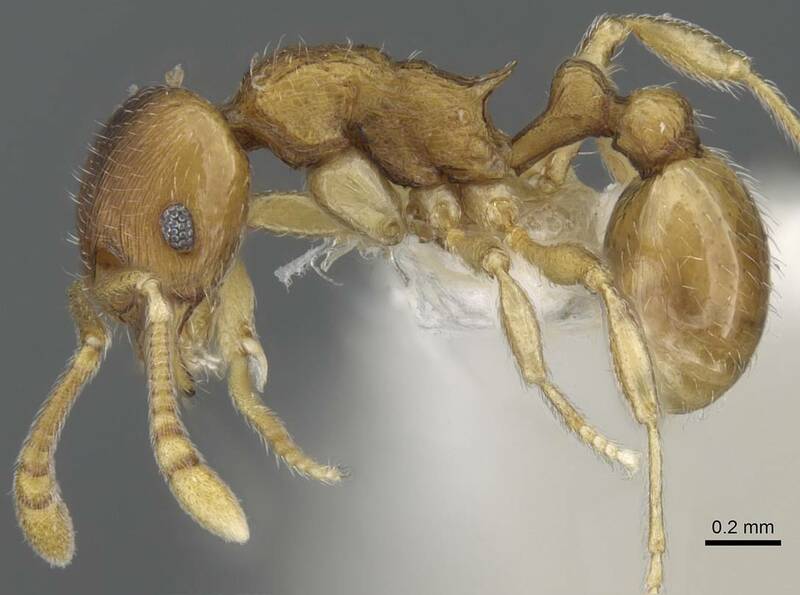 We may not have found the ant at the top of the mountain, but even just getting to the summit where this ant was last seen over 40 years ago, was a totally inspiring journey. This project is documented on so many different platforms (see bellow) and in this post I wanted to try and capture a summary of it in one place. Hacking the Wild is a collaboration between Andrew Quitmeyer, Brian Fisher and Hannah Perner-Wilson. Andy and Brian meet for coffee at an entomology (study of insects) conference in Portland and talked for hours about their respective work in entomology/biodiversity and digital media/digital naturalism. 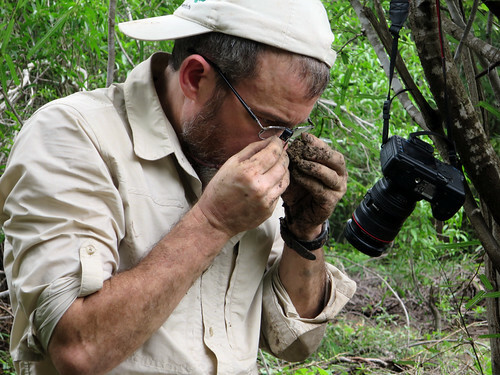 Brian is one of the world’s leading ant taxonomists, he collects ants in order to chart biodiversity and uses this information to conserve habitats. 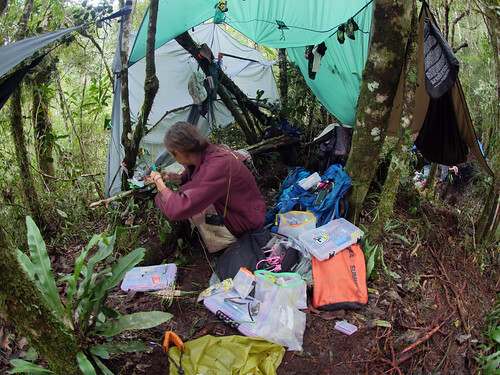 Andy builds technology alongside field biologists in the jungles of Panama, organizes hiking hacks across continents and promotes Digital Naturalism as a field of practice. Brian and Andy decided to launch an experiment that would blend biology field work and the maker movement, looking at technology to rekindle our explorer spirit. Dissemination Lab was born. 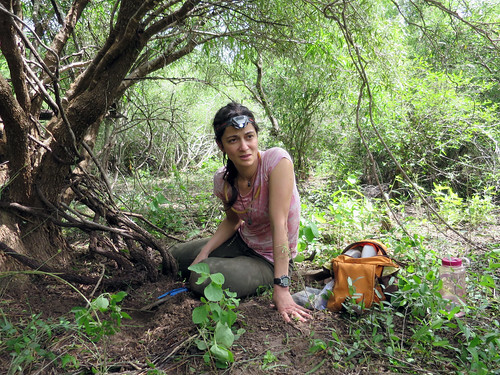 It was to be an experimental initiative for discovering methods of sharing biology field research using digital technology. I heard about the Dissemination Lab project through Andy when he sent out an email requesting people to send in their ideas for this “live adventure”. Instead of submitting an idea, I asked if I could participate. In my life I enjoy nature, science and making digital technology, but I’d never heard of a better way to combine them all in one single experience. My background is in electronic textiles, I develop techniques for building technology that is soft, stretchy, wearable and experimental. My interest is in exploring the materiality and diversity of technology that lies beyond industrialized standards developed for mass production. 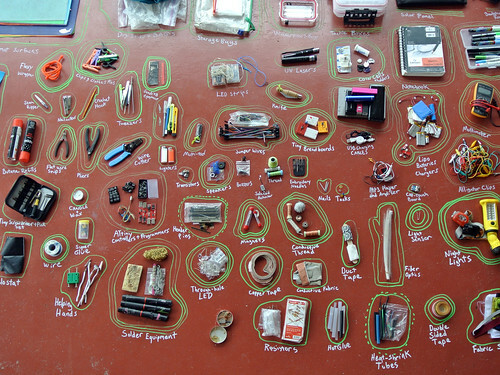 In the context of my work, building electronic textiles in the wild made so much sense. Something I did not know then, but know now, is that there was not only no path through the jungle to the top of this 1960m peak, but also we were not exactly sure how to get up there and whether we would make it in the time we had. Hacking the Wild is what we now refer to as our process and experience of building tech in the wild. 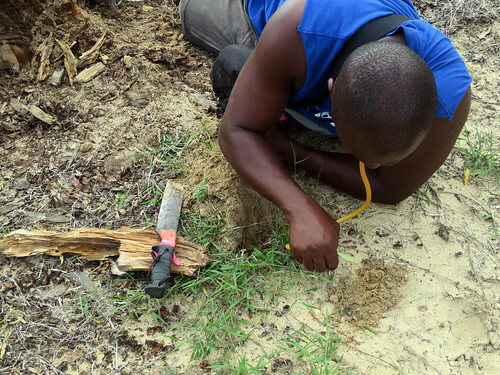 It is the first instance of the Dissemination Lab initiative which took place in Madagascar during February/March 2015. 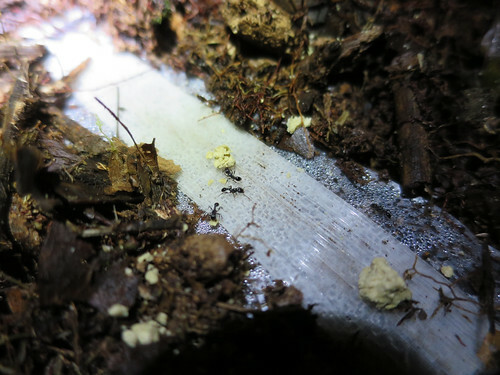 The Eutetramorium Parvum ant specimen that Brian and his team are looking for is described here on AntWeb. Andrew and I had several Skype calls and many emails in which we organized our gear. Mostly Andy shared tips with me from his previous experiences with working in Panama and running the hiking hack. This was going to be my very first trip into the Jungle and my image of the jungle was informed by national geographic photography and media equivalent to a Tarzan movie. The following documentation of our 14 day trip to the summit and back is a blend of transcribed journal entries by Andy and myself as well as post-expedition edits and additions. Hannah’s journal entry: “No more car. We take three lakana (boats hollowed from single tree trunks) upstream as far as we can go. This takes about 3 hours. The river is beautiful and in the distance we catch fist glimpse of Anoysian range- where we are headed. Our destination starts to feel real and the face that we don’t know how to get there maybe even more so. We leave the boats in Analamiar and discussions with locals begin to hire porters who will help carry all our stuff (equipment, gear, food) to our base camps (s). These discussions take time, during which we find out that somebody’s father remembers the French expedition that passed through in 1971! We get to talk to this persona and ask him if he remember the route they took and where they set up camp. He unfortunately says it was too long ago to remember. 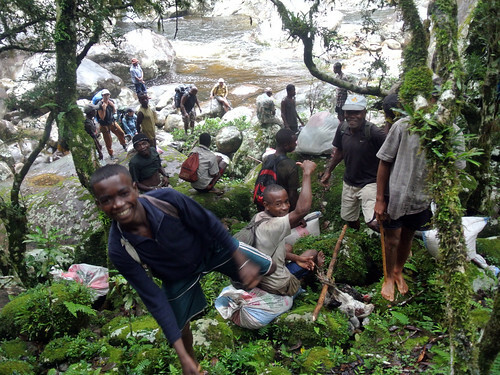 We set off on foot with about 16 porters and only make them until the next village Suavala. In Suavala the porters stop and won’t continue, so we set up for the night and begin new discussion the possible porters from this village. These discussions last several hours, but we do come to an agreement and plan to set off at 5 am the next morning. In Madagascar things happen early, and after lunch one cant’ really expect to get much done. Hannah’s journal entry: “We set off and make a good start following a path that leads through further villages. All these villages and farmed land was not here when the French expedition passed through. In 1971 it was all still rain forest! Crawling along burnt tree trunks, through rice fields, attacked by leeches. 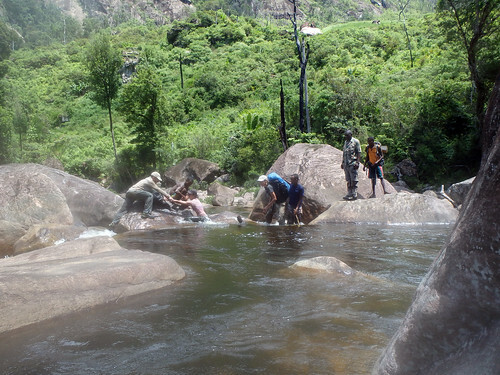 After only about 11 km the porters stop at a farm and we can’t persuade them to continue on the final 4 km to where the French set up their 4th camp be the river, at the base of the mountain. Thus we setup camp to stay the night on the farm. Scarcity of trees makes it hard for Andy and Hannah to find places to hang their hammock tents. 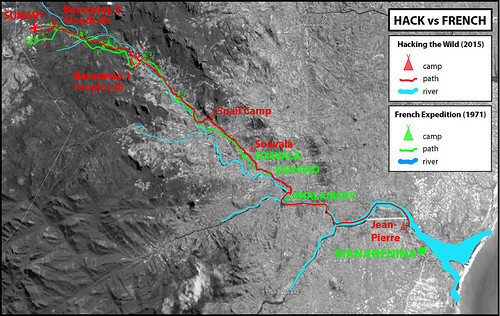 Andy’s journal entry: “We had just 3km to go to make it to base camp. It took us the entire day. Crossed burnt rice fields on slippery logs. The river was even harder. Giant boulders and stormy rapids made for magnificent videos. But a slippery wet climb. We stop only 200 meters from camp. Our target. Set up camp. Andy’s journal entry: “Another Fantastic and productive day in the camp. Felt like this had been the day we relaxed the most, looking back, we tackled all sorts of difficult problems. First, it was sunny for the first real time. We went down to the river and managed to clear a long backlog of journal entries. Accidentally dropped an SD card into the river, but i think it was at least 50% baked up (Lucky I had done that!) We brought our 5 day old muddy clothes down to the river today and swam about this magical place. Hannah and I then jammed on design projects for the day on boulders above the rapids. Project 1 was to try out rope-based aerial photography. One of the chets or guides made a kickass bow and arrow for eel hunting. We are going to try to use it to shoot the rope over, but then decided to just use a rock. While we were at our first basecamp it became apparent how useful Google Earth was in reaching the summit. Brian used it to determine a route around the cliff-face that was in our way, and I had a strange moment in which I felt technology was really an extension of the self. It was like having built a giant periscope that allowed us an aerial view of our location – giving us a different perspective that would allow us to achieve our goal. Andy’s journal entry: “Got sick maybe I shouldn’t have eaten the cold 9 day old meat. Whups. Slept a long time. Frustrating to not be able to do anything. Everyone was very nice to me. Fever broke in the night, now just ache-y. Since data was not cheap (6$ per MB) we limited our Internet activity to posting brief updates and 640×320 images to Twitter. To save on typing time (battery life) we emailed photos of handwritten journal entries to Erika (Thank you!) of Open Explorer who transcribed these and posted them to our live journal feed that we hosted on their site. Possibly we were not very well prepared on the social media front. For all of us this was the first time using Twitter as medium for publishing work from a remote location, and for me my first Twitter post ever. 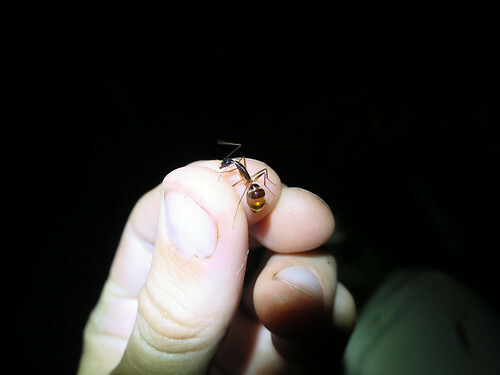 None of us had a great following, and probably we hoped that the novelty of posting live from the field would engage people and attract attention from the entomology and maker communities. We had no idea what to expect, and even now that the documentation process is still ongoing, we’re unsure of how our work is being received. 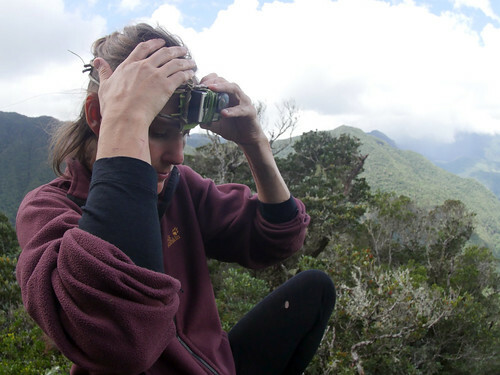 Andy’s journal entry: “Up to Cloud Forest Base Camp. Felt great this morning (sickness mostly gone). Saddened to leave our amazing lower base camp. 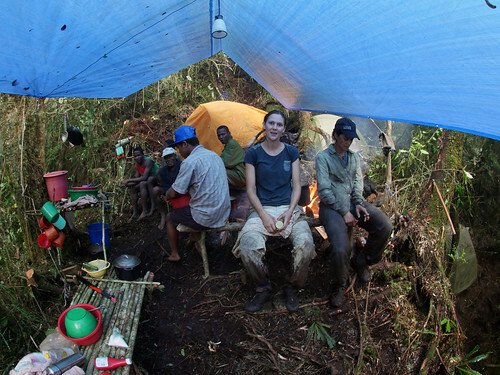 As Hannah said we could have stayed at this luxurious camp we built for weeks building all sorts of things. The jungle is a ridiculously inspiring place to work. The biggest challenge is to not be overwhelmed by the possibilities. I think Hannah and I have been tackling all these challenges excellently together. The project, (sharing research, building electronics, designing mobile labs, surveying) is already huge, but we have been helping eachother, watching out for each other, and tossing ideas around together. Such a luxury having her with us. We walked, or really climbed, with backpacks straight up for 4 hours to the cloud forest camp. One porter carried a full live pig all the way up. They slaughtered and BBQ’d it up here last night. I had never seen such a thing first hand. The Internet, despite being such an ideal platform for dissemination, proved a tough challenge on-route and in the jungle. Establishing the connection via Satellite technology was not the hardest part. Building up motivation to switch on the device, focus on the screen, communicate with the rest of the world was harder. But is was not like we did not want to share what we were experiencing and doing, it was the mode of communication – reminiscent of a different life – that put us off. What modes of communication would be more suitable for posting from the wild? What wild communication protocols exist? Andy mentioned a technique for bouncing data off the moon. This immediately felt much more romantic and appropriate. Even texting an SMS on an old phone felt more in place than opening a laptop. Andy’s journal entry: “The Summit. This basecamp up in the clouds only has 3 Days. Day 1 we had to rest and set up camp. Day 3 we had to pack and prepare. So before we even realized it, we suddenly knew that today, Day 2, would have to be our chance to summit, and find that mystery ant. We shove as much food as we can into us at 5AM and head up into the unknown. There are parts where we are crawling up waterfalls and snaking around chasms. mostly it becomes a long enjoyable walk through a rapidly changing landscape as our guides chop a minimal path through the jungle. At no point are we ever sure our path will actually bring us to the summit, and not just a dead-end ridge. 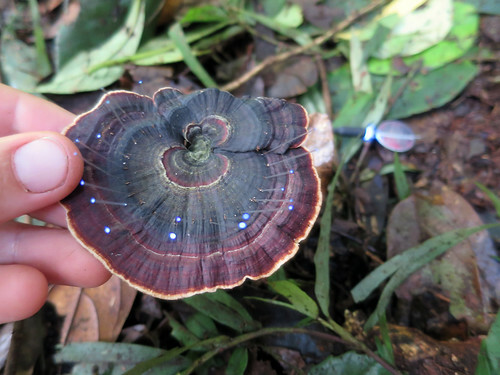 The jungle gives way to a psychedelically shifting new types of forest. Suddenly everything is spongy and teal. Then it is all burnt. Then grasslands. 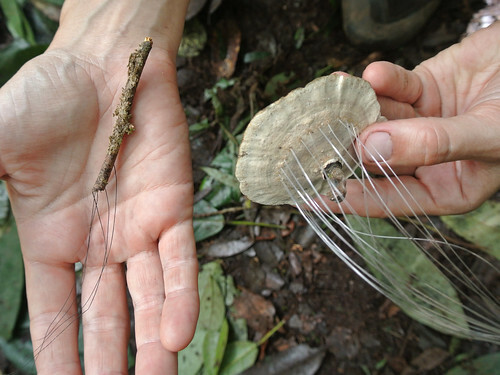 We see bizarre new forms of plants. Andy’s journal entry: “Final Day in Cloud Camp. Didn’t find the ant. Looked everywhere at the summit, but no – show. Brian is anxious. After so many years, we are here, but no ant. Against his own judgement, he decides to lead a SECOND expedition up to the top to hunt for that ant once more. It’s gonna be crazy because he’ll have to pack everything in camp today as well when he gets back from the top, AND then be ready to leave at 3 AM for the long walk home. While he is gone, Hannah and I try to finish up and document beaucoup de notre projets. I become a tiny bit frustrate because I realized that before, I kinda thought I had the excuse that the reason that some of my project electronics looked terrible was because I’m in the jungle and EVERYTHING IS HARD TO DO. But now Hannah is here and her hands turn vines and wires into beautiful objects. She has those smart, strong hands of a real craftsperson. Meanwhile, I cobble together some fun projects with my less-honed aesthetic. I turn leaves into an electro-tongue display. And I make the worst robot ever from mushrooms and a linear actuator. It’s so stupid looking, hobbling over the floor. Get up at 3AM to take down camp, eat, and leave at 5AM. I shove as much bland rice into me as possible. The Chef, Berlin, also has a little sack of sugar I start eating mouthfuls of: I am camel-ing up whatever nutrients i can before our 12+ hour hike into the unknown new path back. Walking down a mountain in the dark is super difficult. Also WALKING is a wrong verb. We moreso do a controlled fall for 3 hours. 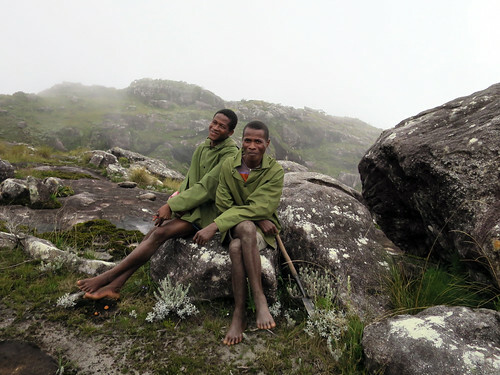 Make it to the 540m raincamp and barely give it enough respect. Just march through. Brian is CRAZY fast at this. Hannah and I keep getting lost, and have to look for clues. Tiny ridiculous clues in the terrain. Like disturbed patches of moss to track where everyone is. This is crazy. When we get to deforested areas, we start to move fast, but get tired-er, hotter, and thirstier. We find guava growing along the path and hannah feeds me some which saves me and prevents the trail-crazies. I stumble along for hours behind a woman carrying a baby and ton of vegetables to go to the market. She’s amazing. 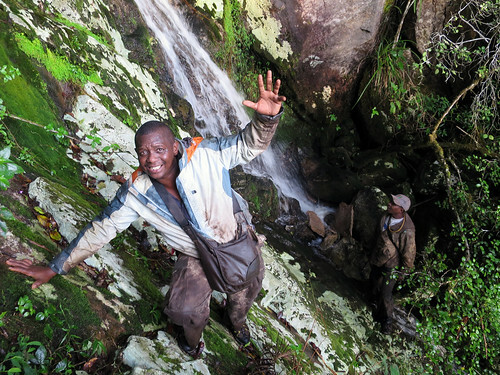 She uses our porters (one guy named “James Bond”) to carry her baby across rapids for her. Andy’s journal entry: “Death March (Part 2). Made it! We left at 5am and walked ALL DAY. We covered what had taken us 4 days, and got through it in one crazy day. Made it at 1am, ate a meal, and passed out at 3am. A full 24 hour day. After that crazy march, we got up at 7AM, packed up and started the long drive to Ft. Dauphin. From our drive-in, the 100km took us 10 hours with river crossings and quick repairs. But we had more problems this time. The battery doesn’t work AT ALL. So we had to push it starting. This seemed ok, until we realized that if the car stalled at all in the long trip of mud and rivers that we had to drive through, we’d be totally screwed. Brian is an incredible driver. I don’t understand how the car can b SO sideways at times and not tip over. On top of the battery, other problems started happening. Weird grinding noises and things caught underneath that started sounding worse and worse. We fixed and shoved the truck out of really hairy predicaments all day, but now, just 17 km away, on a nice flat road, the transmission goes out. So badly destroyed that the car cannot even roll or be towed. Brian says for 15 years he has driven this beast, and this is the first time it has actually, all-the-way failed on him. One of our evening activities was to draw up individual maps of our trek up to the first base-camp. Then we passed our maps around and explained them to each other. 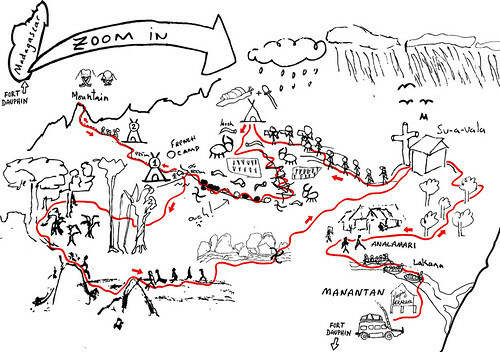 I loved seeing everybody’s different drawing styles and from these hand-drawn maps I’ve compiled a map of our entire route – from Manantanina to the summit and back. Enjoy! Brian is passionate about ants. 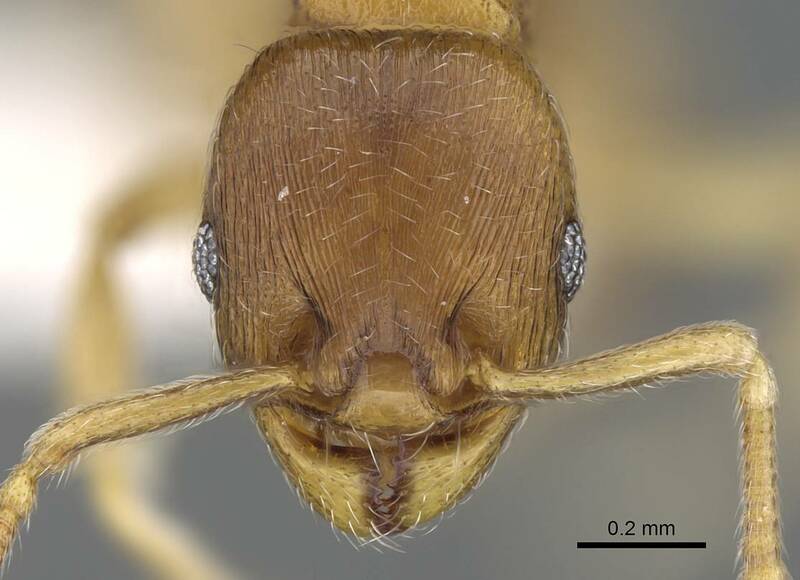 He specializes in the large-scale discovery, description, and naming of African and Malagasy ants. 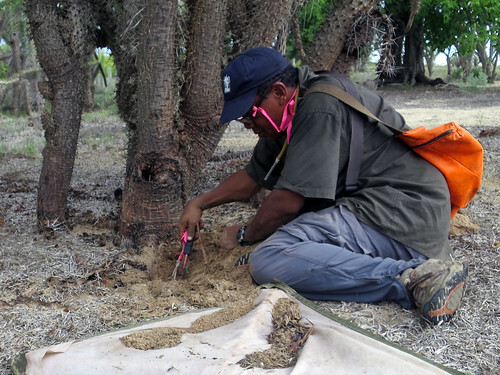 His inventory work in Africa and Madagascar demonstrates the feasibility and challenges of conducting global biodiversity inventories. 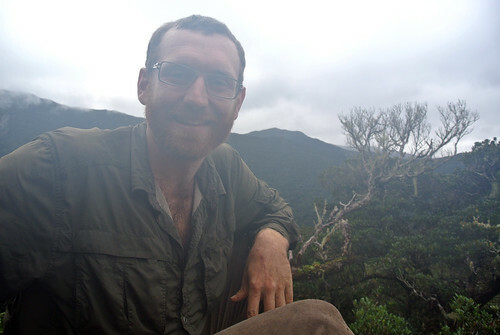 Andrew is a polymath adventurer interested in discovering new means of exploring and sharing the living world. As a Georgia Tech PhD student, he researches how digital media can be used in the study of animal behavior for exploration and outreach. He develops techniques and tools for expressing ideas in engaging and powerful new ways. His trans-disciplinary, multimedia works have been featured in outlets such as PBS, NPR, The Discovery Channel, Cartoon Network, Make Magazine, and Wired. Village elder guide from Suhavala who brought calm to crazy situations, seeing him ahead, pointing the way, meant there was somebody looking out for us. 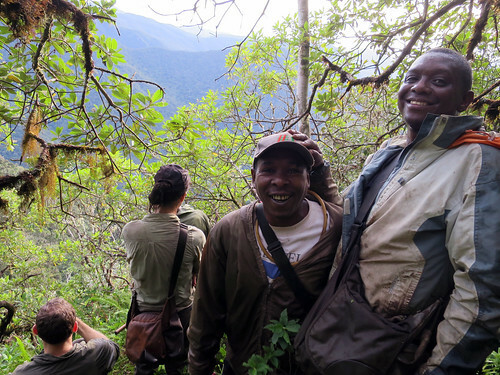 Guides and honey-hunters from Suhavala, who did re-con to find our way up the mountain. 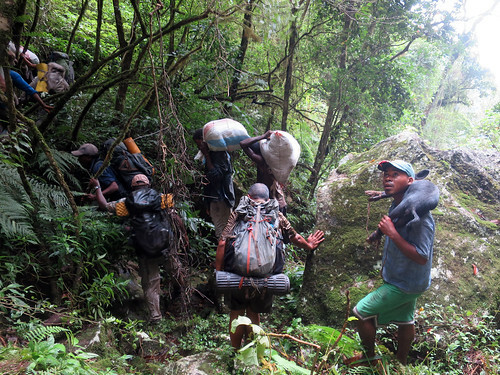 They hacked our path through the jungle to reach our second base-camp and then the summit. Great cook from the village of Suhavala. The roughly 20 porters we hired in the village of Suhavala to carry our gear to our two base-camps. The expedition ended for Andy and me the night the car broke down and we jumped in the taxi that the car mechanic arrived in. Back to hotel Mahavoky in Fort Dauphin for a few hours sleep before our flight to Tana at 6 am the next morning. We made it to the summit, but we did not find the ant. I have not fully realized that I may never go back up that mountain again. Brian’s experience got us to the summit with such efficiency. 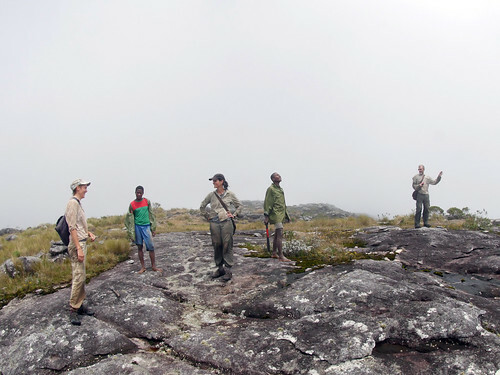 Even if I return to Madagascar, reaching that summit again would entail a whole new expedition. The paths we trod and the camps we left behind are still there now, but who knows what will stay. Will our camps become farms? The jungle turned to rice fields? It appears this is what happened to some of the French camp sites after their expedition passed through in 1971. One of the farms we passed on our second day, where we were served manioc, bread (a spinach like leaf vegetable) and given peanuts, could have been their 1st camp. “Finding the ant” remains in the back of my head as a placeholder for some sort of distant goal. Somewhere to head for, while concentrating on all that happens along the way. This feeling is definitely a remnant from my overall experience during this expedition. Why did we struggle to pack a whole studio full of supplies and work surfaces into an amount we could reasonably carry on our back? Then carry it out into the jungle to build tech in the wild? – Site-specificity: The environment as a resource and source of inspiration. 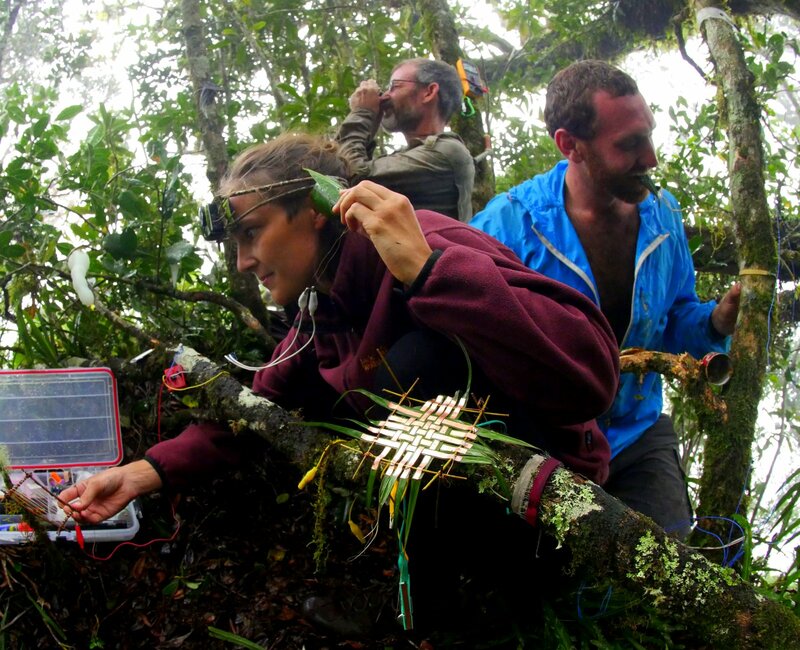 The jungle is an amazing setting for building electronics. Surrounded by nature so dense that sunlight barely hits the ground and a volume level of insects higher than a busy intersection. One of the most inspiring discoveries we made, once we set up our JungleLab at the first base-camp, was that the plants and animals growing and living around us were extremely useful building materials. – Making as a means of exploring: Putting the act of making into the foreground as a means of experiencing a new environment. Just like using a magnifying glass to see things up close, or helicopter to get to an otherwise unreachable plateau, the act of making can be seen as a tool for discovery. – Lifestyle: Moving through the world while practicing a trade. In their literature naturalists are frequently explicit about their choice of vocation coming in part from a love of being outdoors and spending time in nature. Why can’t engineers want to build stuff outdoors too? In digital media, I’ve never heard anybody be enthusiastic about the typical lifestyle of a programmer who likely spends much of the day sitting indoors, in front of a keyboard and screen. I believe that people building and working with digital technologies enjoy the time they spend with the technologies they use, but the environments these technologies are bound to tend to be painfully uninspiring. 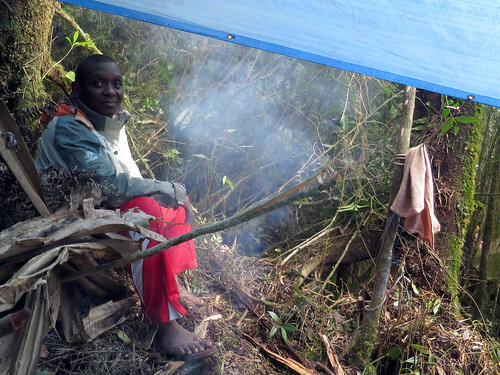 An important part of working in the wild, is being (living, breathing, sleeping) in the wild. , (3) bring stuff back. The “building there” part also came more laden with insight than I’d imagined. Making things is simply such a fitting way to explore a new environment. As a process it works similar to a lens through which you can look at things and see them differently. For example I was looking for a good material to make a speaker membrane from – all of a sudden everything I look at becomes a potential material for moving air. I touch, handle and look for things that have ideal properties for amplifying vibrating and moving air. One leaf in particular (still trying to find what plant it was from >> reddit.com/r/whatsthisplant/comments/303raf/anyideawhatplantthisleafisfromfound_in/) worked especially well as a coiled membrane and resonant body. The “bringing stuff back” part entailed what I had expected it would, that we would build stuff and document it to share with the Internet. But besides project documentation we brought back so much more we want to share. If only for entertainment sake, we definitely want to convey the adventurous aspects of the expedition. What we learned by setting up our JungleLab, then realizing we had enough gear with us to easily spend some weeks camped out and making stuff, is high on our list of things to document and publish. All the great exchanges between Andy and myself about why we do what we do… All these things we’ve brought back, we are currently digesting and slowly sharing in different ways (see bellow).